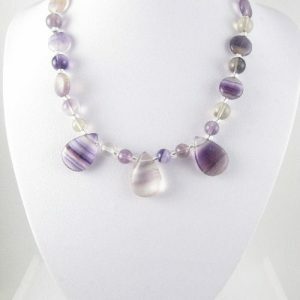 Amethyst necklace with matching earrings. 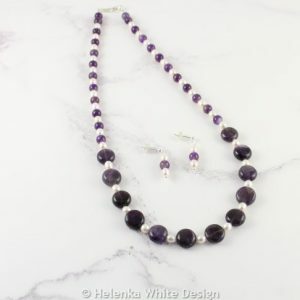 This beautiful Amethyst necklace and earrings set makes a lovely git for women who love purple and semi-precious stones. 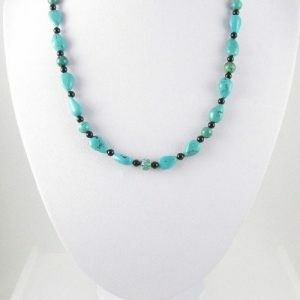 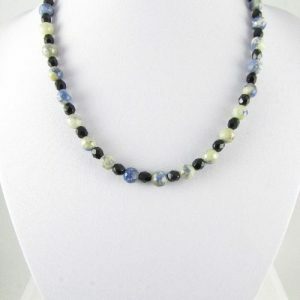 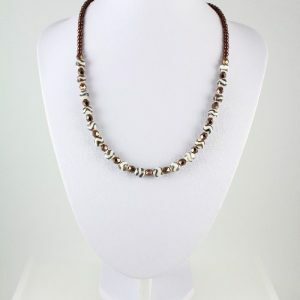 This beautiful necklace has been handcrafted with Brazilian Sodalite beads and fire polished Czech beads. 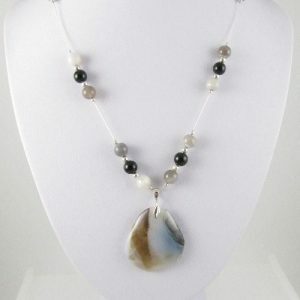 Handcrafted Mystic Agate necklace with facetted Mystic Agate beads, Mystic Agate focal bead, fire polished Czech beads & Sterling silver lobster clasp. 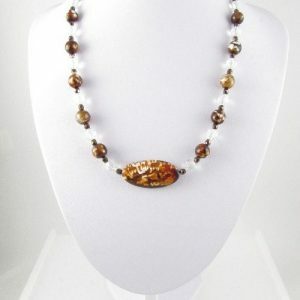 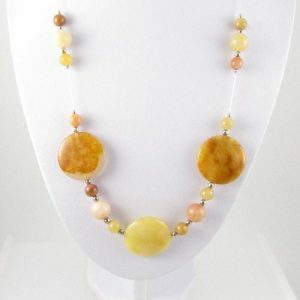 Handcrafted Golden Honey Jade necklace made with Golden Honey Jade coins & beads, Sterling silver beads and lobster clasp. 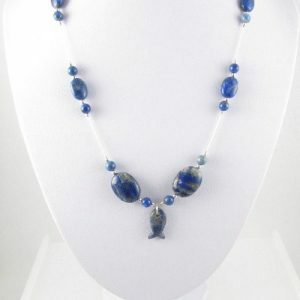 Handcrafted Lapis Lazuli necklace and earring set made with Lapis Lazuli beads, Sterling silver beads and lobster clasp and a Lapis Lazuli fish pendant. 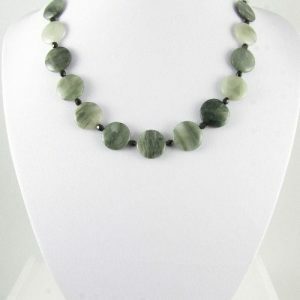 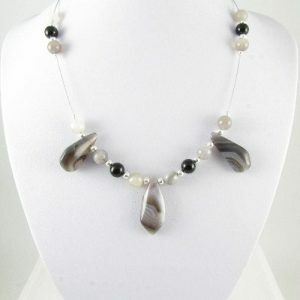 Handcrafted Botswana Agate necklace with matching earrings, a grey freeform Agate pendant, black and Botswana Agate beads & Sterling Silver beads. 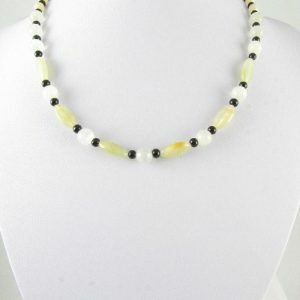 Handcrafted black striped Agate necklace with Agate beads, Sterling silver beads, Japanese seed beads, black Obsidian beads & a black striped Agate pendant. 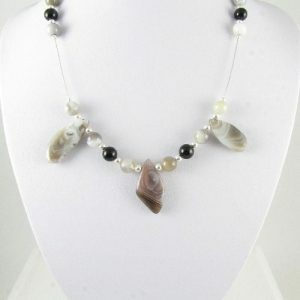 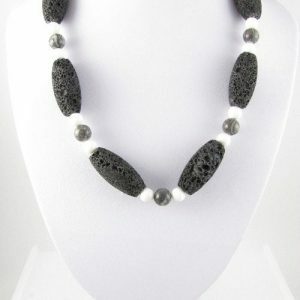 Handcrafted Lava bead necklace with Lava beads, white Jade beads, Snowflake Obsidian beads, Fossil Jasper beads and Sterling silver lobster clasp. 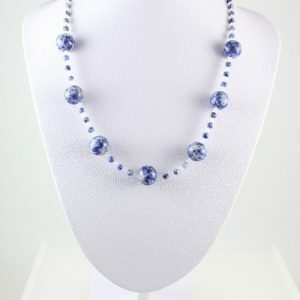 Handcrafted Fluorite pear drop necklace with Fluorite beads, coins and three pear drops, Japanese seed beads and Sterling silver lobster clasp. 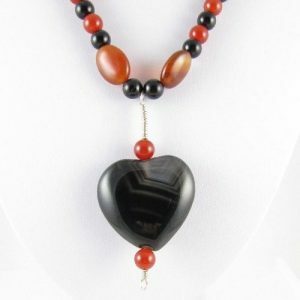 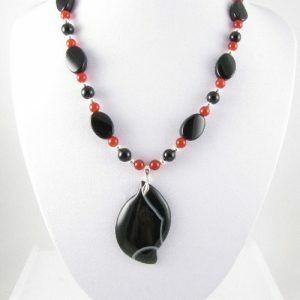 Handcrafted Agate heart necklace with red and black Agate beads, black Obsidian beads, a black striped Agate heart pendant, Sterling lobster clasp and wire. 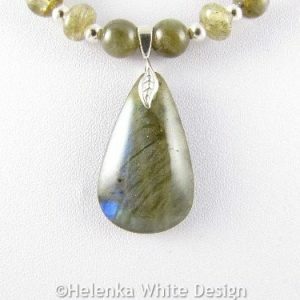 Handcrafted labradorite necklace with Labradorite beads, rondelles, a Labradorite pendant, Sterling silver bail and beads and Sterling silver lobster clasp.